Next time you are looking for a DJ in your area for your college event, you do not have go ask around for a good one any more. 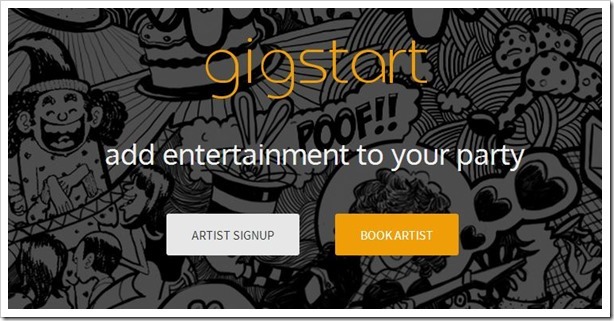 Try Gigstart, an online portal that lists DJs, singers and entertainers who you can avail for your event. Anyone can signup for a artist/artist manager account which will later be verified by Gigstart and artist profiles will then be listed on the websites. Event managers can now browse through the list of artists and get to know about them. Any artist who they like can be contacted using the contact form. Event managers can also use the Book Artist button to request for the type of artist and mention their budget to get suggestions. We reached out to Atit Jain, founder of the Gigstart, to shed some light on the business which is due for a beta release at the end of this month. Q. What does Gigstart aim at doing? What we aim to offer to the service buyer is a seamless and transparent connect with the entertainers. Eradicating the numerous channels involved in a conventional event booking process, we also aim enable customers make an informed choice through reviews and ratings. Q. What made you plan this venture? A. Earlier while working on our pet project The Weekend Consultant, we came across more than a dozen queries related to venue and artists booking for private and social events. We figured out numerous options for venue booking, but there was no easy way of booking entertainers. To understand it better, we tried booking some performers for an actual event, the market turned out to be highly unorganized, majorly dominated by event planners. Also the money they charge as facilitation doesn’t seem to justify the work they are doing. Q. How does it work? How do you verify or review your artists? A. Technically, all that a performer needs is a sign up. Putting up his/her best samples is actually not mandatory but yes preferable and the experience so far says our artists rather like the engrafted portfolios in their profiles on Gigstart and so do employers. Once a member signs up completely, his profile is public for the world to see and book. Similarly, the user can raise a request for booking through a quick quote or can browse through various categories, find out his preferences and book. We only list verified artists. We call each and every member personally and ensure they get a nifty profile. Once they obtain their login details, they can anytime edit their performance details. The process is a breeze! We use feedback and testimonial to review an artist. No review can be made public without passing our basic credibility check. No matter how complex it may sound here, but we have an ironclad security and strong back end to render ease to our users. The turnaround time for every online query is 2 hours. A. Atit is an engineer from BITS Pilani who and an adventure sports fanatic and a foodie. He worked with JP Morgan for two years before taking a plunge into the world of startups. He was one of the core members of a Mobile technology Startup where he worked for 27 months before starting Gigstart. Madhulika is an MBA by qualification with a keen interest in reviewing food and movies. She worked with Bharti Airtel, post that she took up startup assignments in order to understand the ecosystem better. Q. When did you launch? What is current user base and what is the traction that you are getting? A. We are looking at a beta launch on 30th April. We have successfully organized 54 events till now with more than 85 artists that got hired via Gigstart. The website has been getting over 2000 page views every week and we get at least 8-10 phone calls a day on our number (84680 84680) for their interest and queries. Q. Tell us about your funding? A. We are bootstrapped, just in the process of making our investment winning ppt. A. None as of now. Though we are actively looking to get some industry experts to advise us. Q. What is your monetization plan? A. We charge a nominal 10 percent fee on hiring. Also this is levied to the artists. Moving forward, we intend to charge a listing fee to artists. We are also exploring the possibility of moving to a lead based model for artists. Adding to it, we offer services to artists like digital portfolio, consultancy and online reputation management. Q. Why do India, a place so deep in music haven’t seen startups like yours? A. Well that may not be completely true, a lot of startups are already working to uplift the music scene in India. It is not just music we are working for. More than 16 categories and 100 plus subcategories, all artists are given a platform. We believe these art forms have great potential that needs to be fully realized. Right from our clothes to our travel booking needs everything has gone online, then why not entertainment booking. Online gives us the most basic advantage of a world without brokers. Q. What’s in store for future and how viable do you think this idea will be? A. We are looking to launch simultaneously in different metros. Also looking to raise funds and gain mentorship for our initiative. Statistically, Event industry globally is 600 billion dollars with at least 20-30% being spent on entertainers. In India, the wedding industry alone is 25 Billion dollars with 10% being spent on entertainers. The gig scene in India has already taken the stairs and last year India sold tickets worth over 8 lakhs for performances. So basically we are saying, there is a huge potential in the idea, all we need is aggressive execution peppered with some pardonable mistakes. India truly is a place where the entertainment industry still remains an untapped opportunity for the startup space, however, it is absolutely the most inspiring times for startups in India to get in that zone.